For every child who has worries - whether they are big or small. Illustrated by the winner of the Red House Children's Book Award 2013. From the bestselling team behind Mum and Dad Glue and Leave Me Alone comes a comforting and compelling story about worries. 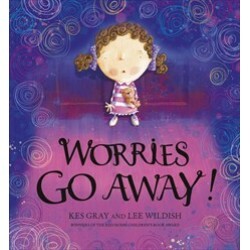 When a little girl feels worried she goes into a world of her own. At first the world is full of cream cakes and cola but soon the worries begin to take hold... Only her family and friends can help. The gentle rhymes and imaginative illustrations give a difficult subject a wonderfully light touch. A must-have for any child. Illustrated by the winner of the Res House Children's Book Award 2013.